SnapCall: Dual Shot-Blockers: Intimidating or Inefficient? Dual Shot-Blockers: Intimidating or Inefficient? Kentucky's freshman center Willie Cauley-Stein has been a shot-blocking machine of late. In five games since fellow Wildcat freshman Nerlens Noel went down with a torn ACL, Cauley-Stein has averaged a whopping 3.8 blocks. The 7-foot, 244 lb. big man swatted just 2.1 blocks per game in 20 games while his teammate Noel was still in the lineup. So, why the uptick? On the surface, Cauley-Stein looks significantly more comfortable roaming the paint without having to share the defensive duties with the tallest flat-top in basketball. This got us thinking: is it really advantageous to have two shot-blockers on the court at the same time? SnapCall polled the TV audience during Kentucky's game against Georgia to measure the popular opinion. To begin breaking this question down, we need to look at it from a basic strategic perspective. If a team has a lone shot-blocker on the court, that player will generally know exactly when he needs to slide in front of the rim to help guards with penetration. However, when there are two trees on the court together, it can create confusing overlap in roles, and with that, hesitation. Let's imagine that you're a 7-footer who is expected to protect the rim at all costs. Next, throw in the fact that your front-court teammate is another high-flying seven-footer who also camps out in the paint on a regular basis. Now, picture the game being on the line with the clock running down. As the play develops, your point guard breaks down on defense and allows his man to penetrate the lane. It's time to make a snap decision. If you were alone on the block, there would be nothing to think about. You would immediately leave your man to stop the ball from getting to the rim. But you are not alone. Your teammate is standing on the opposite block. Pause the play right there. This is the exact situation that defines the inefficiency of having two shot-blockers on the court together. Instead of simply letting instincts take over, there is an instantaneous communication required between the two big-men, creating opportunity for mistakes. If both men mistakenly help at the rim, two different passing lanes are opened for the driving guard to choose, often resulting in an easy bucket. On the other hand, both may assume that the other will go to help, leaving an easy finish at the rim. Since dribble penetration occurs often throughout a game, it seems logical that it would be easier to defend with a lone shot-blocker in the paint. Put it another way, having two Dikembe Mutombos on the court together sounds like a great idea. Unfortunately, such a lineup may produce some nice TV highlights, but not necessarily more wins. Want to weigh in on the debate? 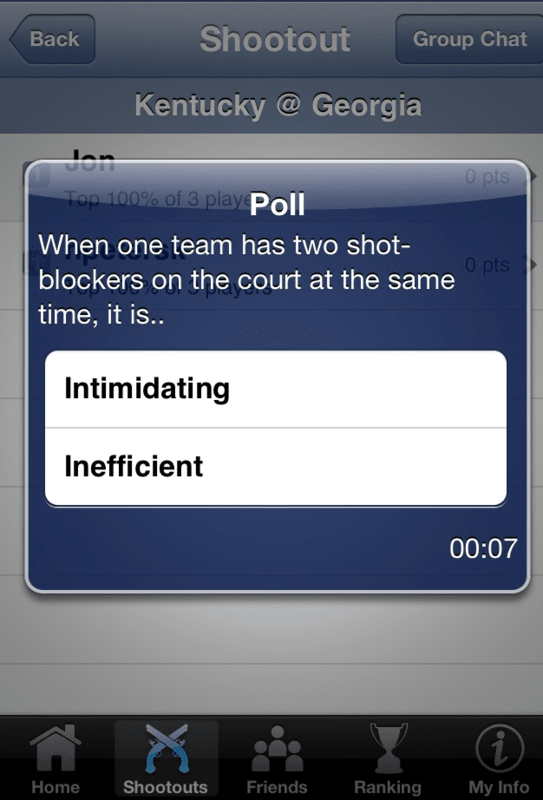 Download SnapCall Sports from the iTunes App Store to make your opinion heard.